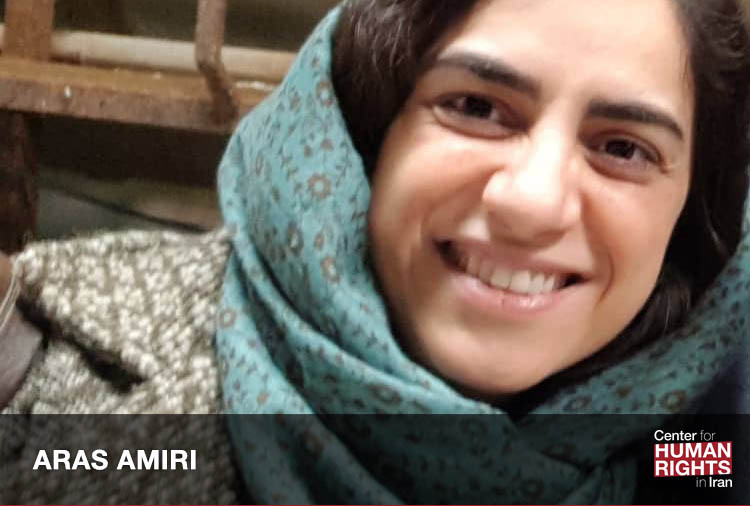 Agents of Iran's Intelligence Ministry have arrested a London-based employee of the British Council, Aras Amiri, and are holding her without access to a lawyer on national security charges, the Center for Human Rights in Iran (CHRI) has learned. "Aras arrived in Tehran on March 8 and went to Amol [northern Iran] to visit her grandmother in the hospital," Amiri's cousin, Mohsen Omrani, told CHRI on May 1. "On March 14, she returned to Tehran and was arrested by Intelligence Ministry agents on her way to the airport while she was in a car with some of her relatives." Amiri's family made the news public on May 1. "The authorities have only said that she was arrested on the charge of 'assembly and collusion against national security' but they haven't said on what basis and she hasn't been allowed to meet her lawyer," added Omrani. CHRI has learned that Amiri, a 32-year-old graduate student at the UK's Kensington College of Business, is being held in Ward 209 of Evin Prison in Tehran, which is controlled by the Intelligence Ministry. Amiri works for the British Council, a UK charity and cultural relations organization governed by a royal charter and British public body. While living in London for nearly a decade, Aras, an Iranian citizen, had traveled to Iran several times to visit family and work on joint cultural projects without problems. "At the British Council, Aras organized film and theater festivals for young Iranian artists with official invitations and permission from [Iran's] Ministry of Culture and Islamic Guidance," Omrani told CHRI. "These cultural and artistic exchanges have been going on for years," he added. "The authorities are not giving clear answers about the reasons for her arrest and the accusations against her." Omrani continued: "It's really strange that they arrested her on this trip without any reason. My aunt [Amiri's mother] has told the authorities that her daughter was not involved in political activities and she had traveled to Iran many times so why was she suddenly arrested this time?" A few days after her detention, Aras' case investigator set bail for her release but while the family was preparing to pay for the amount they were told she must remain in prison according to Omrani. Omrani told CHRI that Aras has received three family visits in prison and has had several conversations with them over the phone. The British Council opened an office in Iran in 1942 before the country's 1979 revolution but suspended operations in Tehran in 2009 due to what it described as "intimidation and harassment" of its staff by the Iranian government amid heightened tensions between Iran and the UK over Iran's nuclear program. In late December, the council said in a statement that 16 of its employees in Iran had been summoned to the office of the Iranian president, "where it was suggested to them they should resign from their posts with the British Council." In April 2018, Iran's Islamic Revolutionary Guard Corps (IRGC) arrested Abbas Edalat, a London-based academic and antiwar activist with dual Iranian and British citizenship.